"Not the slightest chance" was Winston Churchill's April 1941 estimate of Hong Kong's prospects in the face of a Japanese assault. When in December the attack came, his prediction proved sadly accurate in just 18 days of brutal and confused fighting. In this book, Tony Banham tells the story of the battle hour-by-hour, remarkably at the level of the individual participants. As he names individuals and describes their fates, so he presents a uniquely human view of the fighting and gives a compelling sense of the chaos and cost of battle. More than 10% of Hong Kong's defenders were killed in battle; a further 20% died in captivity. Those who survived seldom spoke of their experiences. Many died young. The little 'primary' material surviving - written in POW camps or years after the events - is contradictory and muddled. Yet with just 14,000 defending the Colony, it was possible to write from the individual's point of view rather than that of the Big Battalions so favoured by God (according to Napoleon) and most historians. The book assembles a phase-by-phase, day-by-day, hour-by-hour, and death-by-death account of the battle. It considers the individual actions that made up the fighting, as well as the strategies and plans and the many controversies that arose. 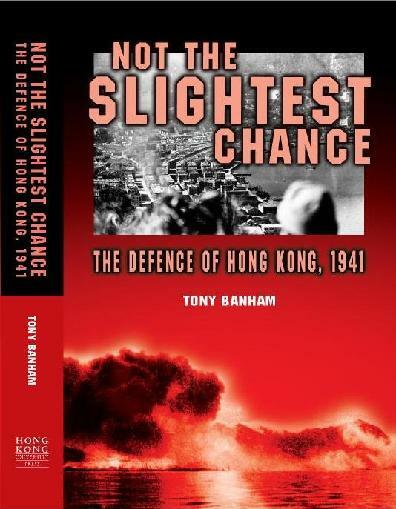 'Not the Slightest Chance' will be of interest to military historians, Hong Kong residents and visitors, and those in the UK, Canada, and elsewhere whose family members fought, or were interned, in Hong Kong during the war years. Tony Banham is a long-term resident of Hong Kong, having arrived in the 1980s. He has been studying the Battle of Hong Kong for well over a decade and has written on the subject, aided in the production of television documentaries, and helped many children of veterans in their researches into their fathers' war years. or buy it in most local bookshops (Bloomsbury, North AmericaCommercial Press Star House, Swindons, Kelly & Walsh, some Bookazines and Dymocks branches, the Museum of Coastal Defence, The Book Centre and HK University Book Shop.